Only Organic Tortillas in the UK! Only Organic Cocktails in The UK! Bordeaux - Château Les Tours de Peyrat "Vieilles Vignes"
Really pleasant experience at this restaurant, nice, chilled staff. Only complaints: expense for what it is, plus being too heavy handed with chilli and salt, otherwise totally delicious. The service at this restaurant was shocking. Particularly given the price charged for food. Firstly, I booked using this website and when I arrived, the waitress looked confused and acted quite rudely as though we were lying when we mentioned our booking. Next, the male waiter/server was extremely softly spoken. The music was reasonably loud yet he refused to speak at an audible level, causing both my friend and I to have to awkwardly lean over to him in order to hear what he was saying, as well as having to ask him multiple times what he had said. The servers also kicked up a fuss about offering us tap water for the table. First they tried to convince my friend to pay for "still water" instead of simply allowing us to drink water from the tap. Next, we were not allowed to have a bottle of said tap water on the table and were only served small glasses. I had walked a long way to get to the restaurant was was quite thirsty and when I asked for a second glass, I was assured one would be brought to me, which did not occur. Overall, very disappointing. This restaurant is very expensive for the shocking service. Great concept, really enjoyable and has a great menu. Food was a little too saucy which overpowered some taste. My partner had a burger which was delicious. My Middle Eastern salad was fine, but a little mushy. The cocktail was awful, I couldn’t drink it. Service was good - I’d go back for a burger but wouldn’t waste money in the expensive but bad cocktails again. Food is lovely but so expensive for what it is, i mean fries with some kimchi on them for 7.50... bit over the top. also the tables are extremely close to one another so don't come wanting to have a private chat. 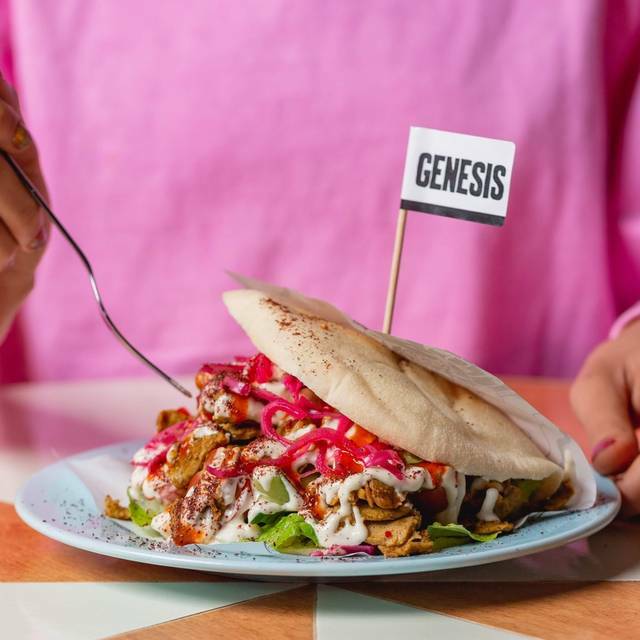 This was my first visit to Genesis, which had been recommended to me by friends and colleagues as a place to visit when in London. 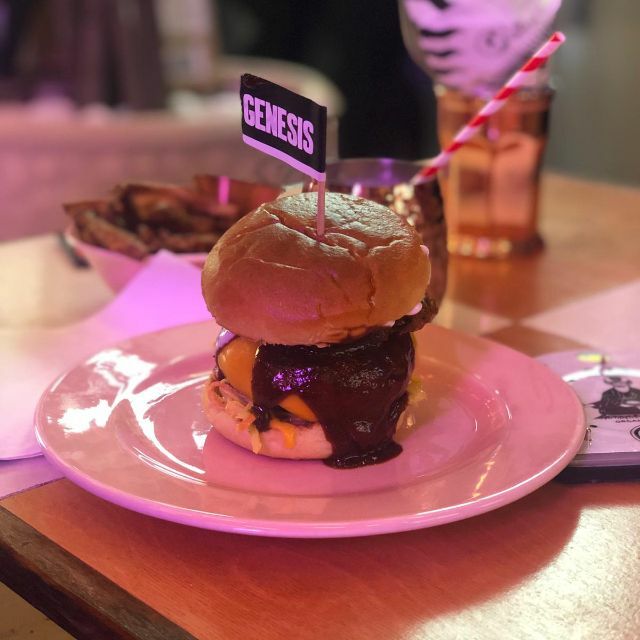 I was told I’d be surprised by the quality, however I was blown away at what dishes (that would be traditionally protein based) the Genesis team recreate with plant based ingredients. 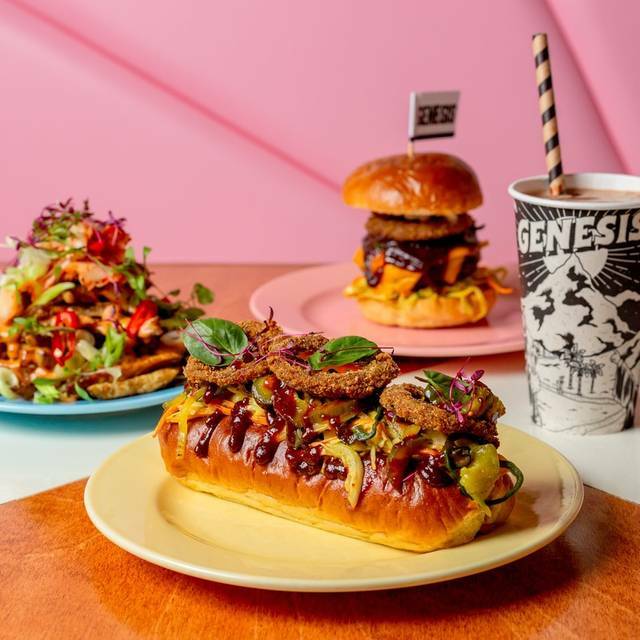 I’m a lover of burger and fries, however my partner is a lifelong vegetarian and generally, when we do visit a restaurant that caters for my preference, she cannot access much other than a few vege’ options. It was terrific to be presented with a full menu we could both choose from and share - even better with the very welcoming team on hand to explain each menu item in advance of ordering. The milkshake is phenomenal, make sure to try this if you visit! Fully recommended for everyone, it will certainly be on our itinerary for our next trip to the area. A great venue, amazing food, blew us away. Service wasn't fantastic - forgot one of our dishes and some staff were a bit too stoned. Stunning food from a fantastic menu and helpful staff. What's not to like! Great food, gorgeous interior! Very good panko avocado tacos. Good value for money. Really delicious and different vegan food. Best place to go if you are new to vegan or want to know what things you could eat, or are trying to convince somebody else!! Great cocktails too! 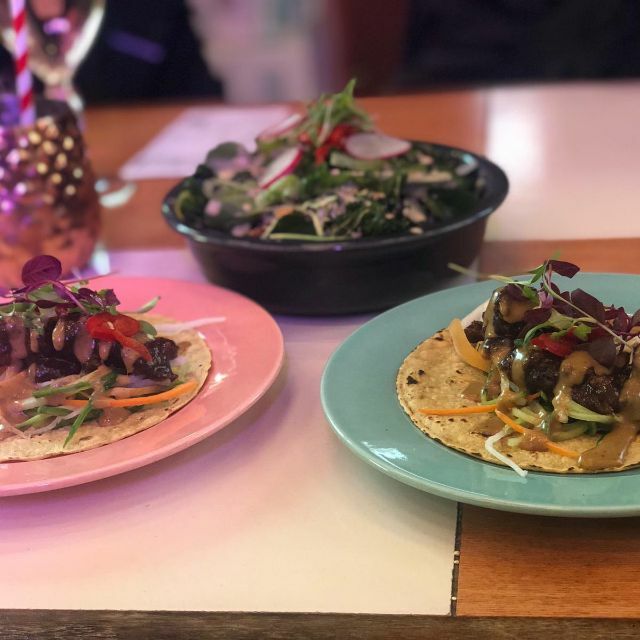 The food here was delicious, and I especially enjoyed the tacos and the matcha mint milkshake. The chef also accidentally made an extra portion of sweet potato fries which we enjoyed. The pink theme throughout is also really good. However, it is relatively expensive but worth the price. The food was over cooked and not as tasty as I was hoping for. 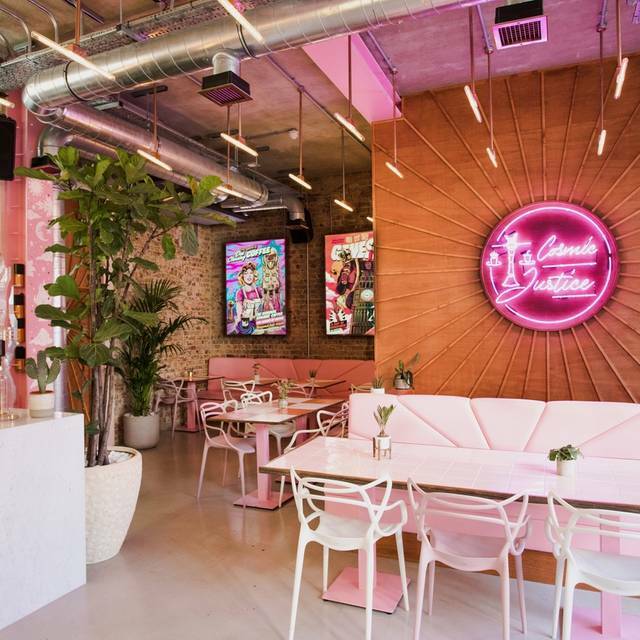 The vibe of this place is amazing, we loved the food and would come back! We had one lovely waitress look after us and was super helpful but in between we had another girl seve is food who wasn’t overly friendly! But all in all great place, amazing decor, yummy cocktails! A vegan dream! Amazing variety for vegans and veggies. Looked and tasted great. Cocktails were expensive or i’d have had more than one. Would visit again. The restaurant is okay, I personally feel it is overpriced. My vegan shewarma wrap arrived luke warm, and the total cost was £85 for 4 adults and a toddler. There did not seem to be much leeway or room for people with allergies to be offered alternative foods. My allergic child did not eat any of the food she was given and we paid full price for her (adult sized) meal. 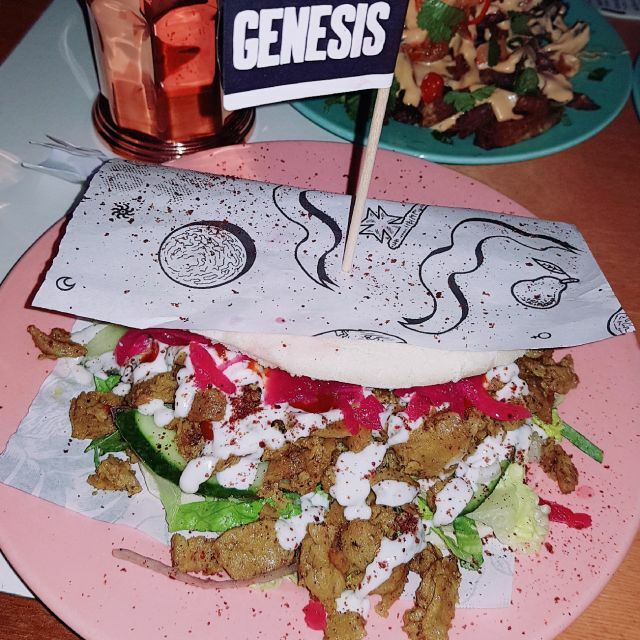 Genesis had some really nice dishes, the genesis burger was fantastic alongside the jackfruit taco. However, some dishes didn't seem to be that flavourful, such as the souvlaki. However, the brownie and ice cream were fantastic and I would definitely make this trip again! Really really enjoyed my experience. Easy to find. Nice location. Staff were very friendly. Menu was easy to read and food was tasty. 100% would reccomend and come back. 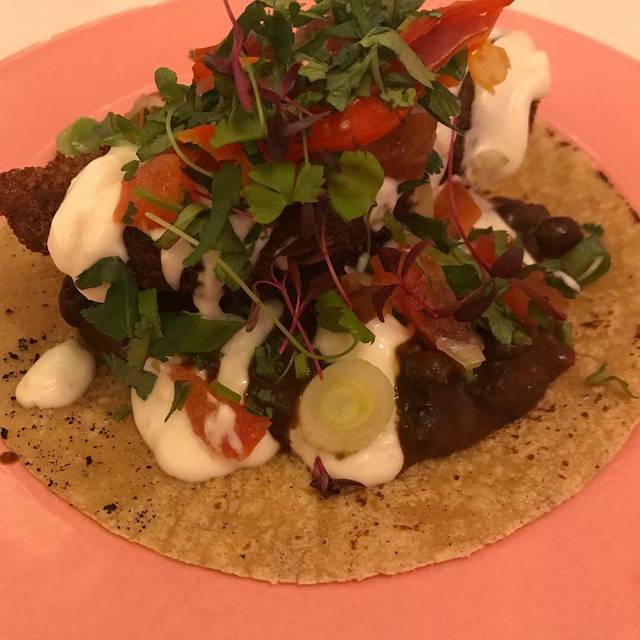 This is my first vegan restaurant but defo not my last. What a great find. Super use of amazing ingredients!! Amazing food! Really nice decor too. It's my second time here - love it. Really cool looking restaurant, but the food was a bit naff. I was really disappointed. Love the food and cocktails. Staff are friendly and the lady who served us was soooooo nice! We had a big group, she was very patient and helpful when it comes to food allergies and intolerance. Had a very average burger (it was quite sloppy) and we were seated in a windowless basement which I didn't really enjoy but others may not have a problem with this. Reasonably priced so good for a quick lunch. 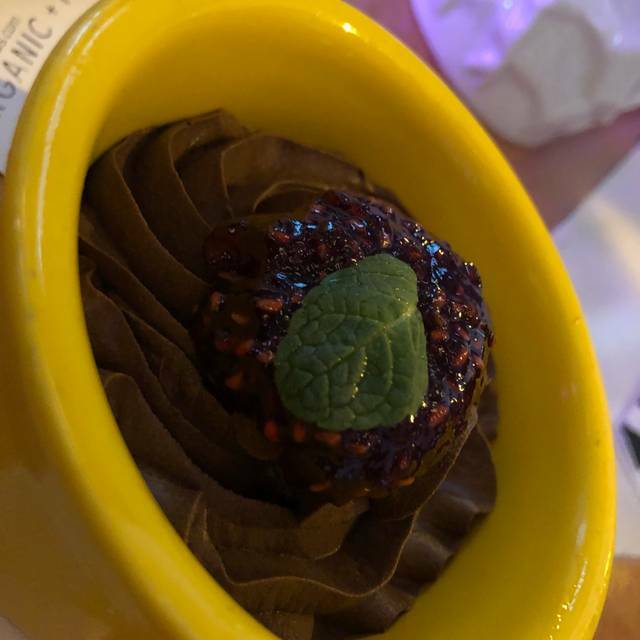 Some dishes were amazing, others were terrible. It's just far too hit and miss to recommend. This was a fantastic experience the food was absolutely brilliant especially the duck tacos and the mac and cheese! The restaurant has a great ambience and the service is quick. The staff all know what theybare talking about... it is great for a change to order anything I what not having to worry about diary, milk, cheese or soya! Prices are reasonable... one you try is out you will want to go back! Delicious food! Warm friendly service. Very cool atmosphere, jackfruit taco is a must!! 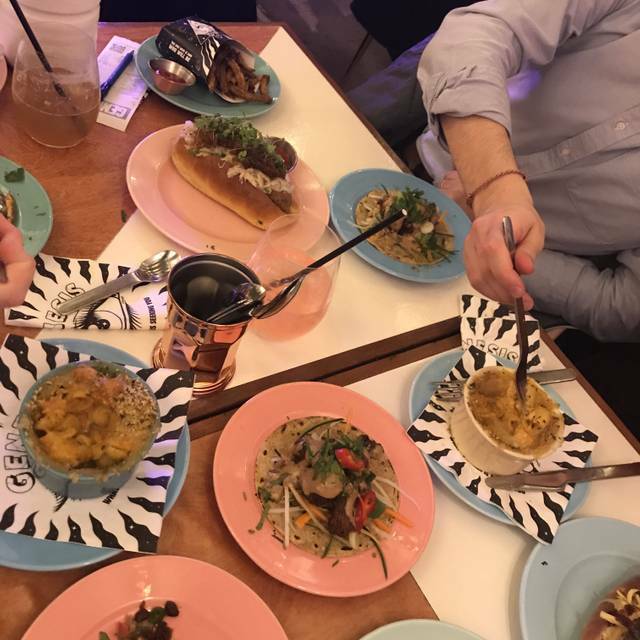 Great variety of food, funky, cool décor. Been twice now and will definitely go back. Lots of variety and good for non vegans to show them how exciting veganism can be! Too expensive for a no table service. Not enough variety. Lovely atmosphere and tasty food Im definitely planning to eat there again ! Great restaurant. Lovely vibe, accommodating and friendly staff. Food was fantastic and I’d definitely go again.